I’ve worked in retail, in fact I’ve spent a significant amount of time in retail before now, and have managed to escape from retail at the expense of being poor, so why oh why would I decide to play a game about running a shop? Because it’s fun! (In this setting, not IRL). Shoppe Keep is an early access game about running a shop within a fantasy medieval setting, this includes everything from stand and item placement, to stock ordering, to dealing with thieves, sweeping and more. Currently the pace of development seems good, with a strong developer-community relationship and regular updates, including an imminent update to Phase 2. This is an early access game that is following the correct path, and it seems to be working out for them. As ever with pre-release stuff, I’m previewing the game as it stands now and it is likely to improve beyond what I state here in the future. 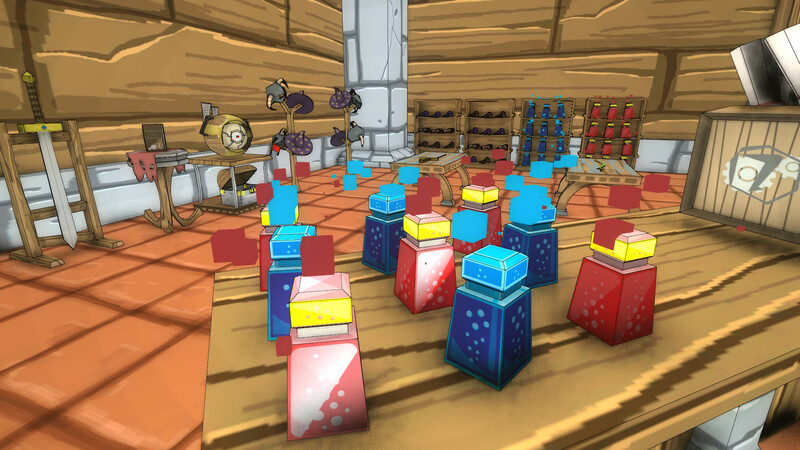 The game starts you out in an empty shop, in first person, with enough money to place a couple of small display tables and order some potions, your go to early game item. After that it’s a matter of selling what you can, ordering in to replace the stock sold during the day, keeping the shop clean and dealing with thieves. This makes for interesting progression as the decision must be made as to when money is invested into more shelving and different items rather than just refilling stock. As you earn more money, the furniture you can afford changes and therefore the stock you can sell does as well. This progression isn’t especially slow, nor is it too fast and in fact feels relatively well balanced especially considering that this is an early access title. The normal run of a game will start with a build phase, which allows customisation of the shop and also the ordering and placement of stock. Then you can open the shop allowing customers in. These customers are of various classes, each with different purchasing requirements. I’d imagine that it would be possible to specialise, but I’m not certain there would be much advantage to it over attempting to stock for every class. During the day it will be necessary to sweep up mess left by customers, who must be disgustingly filthy considering how much grime they drag in as well as restocking shelves and tables, clearing up mess created by customers and ensuring stock levels don’t drop too low. All of this is necessary whilst also watching for shoplifters and stabbing/zapping them when they do appear. The stock system is interesting, with orders being quick enough to have multiple orders in one day if the shelves are looking empty. The process is reasonably quick and intuitive, although the price setting isn’t quite as obvious and having the pricing default at zero can lead to some accidental free samples to begin with. In addition to the furniture and stock there are also a few other bits and pieces, such as the robot helper which will zap thieves and tidy up stock that’s been thrown around. It’s also necessary to repair furniture as it is used, otherwise it will break and have to be replaced. The longer game has a few different elements. Firstly there is the general monetary progression, as you earn more money you can purchase more things and earn more money, but in addition is a levelling system. Once you’ve gained experience you level up and can choose a perk, along the lines of less stealing or shorter delivery times and such. The game also has interesting customer simulation elements, the day will have peak time and the overall appeal of your shop is tracked and changes the number of customers you have. With enough money it’s possible to buy expansions to your store, giving you more space to work with. The new patch that’s coming in a couple of days will apparently also add some additional long term elements as well. Aesthetically, the game is an interesting indie take at 3D with a cartoony appearance sometimes hiding quite basic textures. The result of this is that the game looks good without the development team having to pour many many man hours into every single item. I’m a fan of the look of the game, it’s very functional and unique. In short, there is possibly some polish required on various elements of the aesthetic and UI, but even at this stage the game is very playable. The settings helpfully provide an FOV slider as well as an option to disable the camera bob which I found a little uncomfortable and was glad to be able to turn off, so kudos for that. The system requirements are not especially high, with the only notable requirement being a dedicated graphics card which is generally a good recommendation for any game. I’ve not yet tested it with integrated graphics but can say that my 660ti can handle the game just fine. Compatibility is very good, with Windows, OSX and Linux available and there is talk of controller support coming soon, which means this will be very playable on SteamOS or streamed to a TV. The game is currently available for £4.00 (approx $6.00), which is a good price considering the content that available and the potential for more to come. To conclude, this is a great early access title which may be a little rough around the edges and unintuitive in places but ultimately does what it does well and shows great potential.